These transformations take BIP models and transform them into functionally equivalent BIP models with different architectures. Such transformations have already been implemented in the BIP2BIP tool  . They allow in particular to generate from a hierarchical model an equivalent flat model or a single atomic component by composing the behavior of the constituent components. Flat models have been proven optimal for implementation on single processor platforms. We will study transformations for deriving optimal implementations with respect to given execution platform. 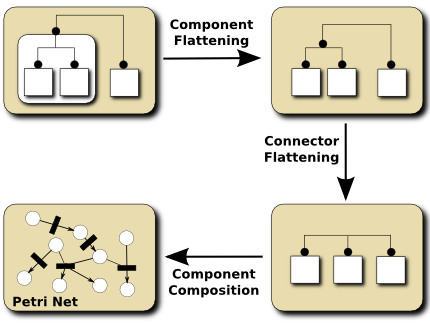 Component composition which composes atomic components to get an atomic component. Using such a transformation allows to combine advantages of component-based descriptions such as clarity and reuse with efficient implementation. The generated code is readable and by-construction functionally equivalent to the component-based model.